Window Replacement O’Fallon. When the windows in your O’Fallon home just aren’t fitting the design you have in mind, and you want an incredible window replacement service in O’Fallon, call BHI, we have the window options you need. We offer an incredible selection of window styles, window colors, window functions, and window replacement and installation services that O’Fallon residents have come to depend upon. For more information on our window replacement services, costs, and window installation time, call or contact BHI now! BHI is proud to work with great companies such as ViWinTech, Vista Window Company and Great Lakes to offer quality windows. If your O’Fallon home needs replacement windows or windows for new construction, BHI can help! Types of windows we offer include Double Hung, Sliding Windows, Bay/Bow, Awning, Casement, Hopper, Picture and Specialty Windows. Great Lake’s premium products are made using state-of-the-art technology, modern equipment, and cutting edge operational techniques. The strength of their parent company, Ply Gem, with over 70 years in the industry, provides the opportunity for more innovative solutions in design, performance and function that go above and beyond your expectations in replacement windows and patio doors. Vista offers unparalleled window and patio door selections that blow away the competition. Vista is one of the premier window manufacturing business in the states due to the fact that their windows are custom made to order, which guarantees the perfect fit for your perfect windows, with a wide selection of hand picked options that other window manufacturers can’t match. 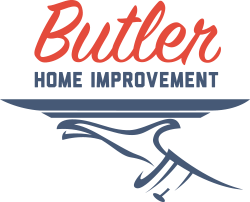 Ask Butler Home Improvement about other features that make our window offerings the perfect way to enhance your O’Fallon home’s beauty as well as your home’s investment. We serve St Louis, St Charles, O’Fallon, Collinsville, Edwardsville, Belleville, and the surrounding areas with window replacement and installation. Give us a call at 618-344-7073 today! Window Type – You want your home to be perfect, and this may mean choosing a window that has specific qualities or functions. The cost of replacing windows can vary based upon the brands/types you choose, the features that those particle windows have, the energy efficiency of the units and whether they are in or out of stock. Current Windows Installed – Older homes may have windows installed that are built into metal frames or surrounded by plaster material and wire frames. Replacing older windows that have these issues can increase the labor hours used to replace your old windows and install new ones. We will tackle any window installation project! Our Window Installation and Window Replacement professionals in O’Fallon can take care of your old windows. Which Floor the Windows are On – Windows that are located on the first floor will usually be the easiest to remove and replace. Windows that are on second or third floors will be more difficult to remove, and this may affect the cost of the O’Fallon window replacement project. # of Windows Being Replaced – The more windows that are needed to be replaced in your O’Fallon home, the more the project will require in terms of cost and man hours. The fewer the number of windows that require installation, the less the labor costs will be. Changes to Window Foundation for New Windows – If the design of the new windows is drastically different from the old windows, the existing space for the windows will need to be changed to fit the new design your O’Fallon home’s windows will have. How Quickly you want the Project Completed – The timeline that you would like for the project to be completed directly affects the amount of time the project will need. If you want the project completed as soon as possible, this will affect the amount of time used. If you have a more relaxed timeline, the installation and repair may move at an easier to work around pace. Your O’Fallon home deserves amazing windows that bring life and light into your home. The Window Replacement and Window Installation services that BHI provides will give you exactly what your O’Fallon home is needing for window solutions, window replacement products, window installation, and any other needs your O’Fallon home may in regards to window services. When you are ready to change your O’Fallon home’s windows, call or contact BHI.